Marc Lieb, why must we have this pointless Porsche-on-Porsche violence? Why? Why? Stewards at today’s 6 Hours of Nürburgring placed the blame on Lieb in the LMP1-class No. 2 Porsche 919 for hitting the much slower LM GTE Am-class No. 88 Porsche 911 RSR of Abu Dhabi-Proton Racing that was in front of him. Khaled Al Qubaisi was behind the wheel of the No. 88 when it was struck by the No. 2 919 and sent into the gravel outside Turn 6. Fortunately, all drivers were okay in this little dust-up. In addition to needing to replace the nose of the No. 2, the team was given a drive-thru penalty for avoidable contact—while they were leading overall, no less. Lieb took full responsibility for the punt on the broadcast, and even went over to apologize to the team after he was out of the car. Here’s another view from what appears to be the photographers’/marshals’ trail around the circuit. Between this and a fire earlier in the pits, the No. 88 is not having a good day. They were in second position in the LM GTE Am class when the 919 punted the No. 88 into the gravel. 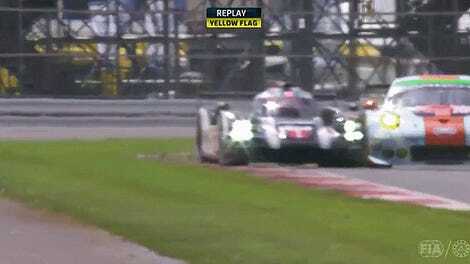 Meanwhile, up front, it’s a Porsche vs. Audi knife fight. No. 2 is still in the mix, albeit in fourth, gunning hard for the third-place No. 7 Audi R18's spot. That being said, No. 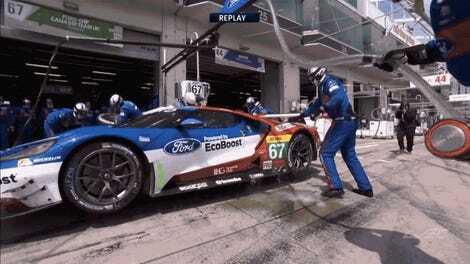 2 has been flagged to come in for repairs after being nudged in the rear by an LMP2-class BR01, which damaged the No. 2's rear. The two LMP1 manufacturers continue to be at each others throats as they’ve been for almost the entire race. If you’re not watching right now, you should be. This isn’t the first time Porsche-on-Porsche violence has shaken up a World Endurance Championship race this season, though. Please, won’t somebody think of the Porsches? !